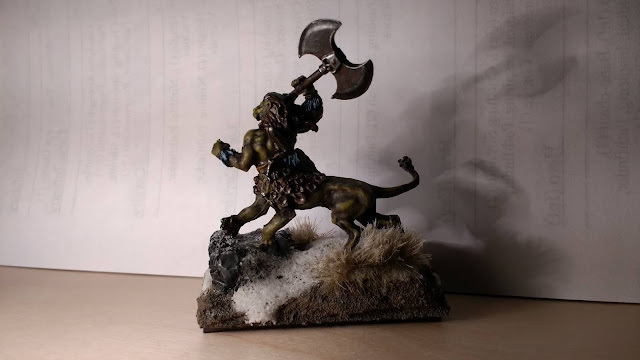 Here's the new Lion Centaur which was finished the night before! I've been working on my blending and highlighting techniques and I feel I'm starting to get somewhere. We arrived bright and early, as I’m being healthier I’d eaten rice crispies, everyone else enjoyed bacon butties… Still I was pleased to note the guys had provided a big bowl of fruit, nice one! Hal had a lovely painted army, I especially liked the Naiad Wyrmriders on crabs! On my left I went to the centre line keeping a distance from the Shamblers, no way they can charge me, over to George. He reveals Brew of Haste and gets one unit into a Stampede... And then with Surge 15 tries to get a 2nd in, he needs 8 successes and gets 7! (phew) Thankfully my Stampede takes one charge fine, two would have been unpleasant! 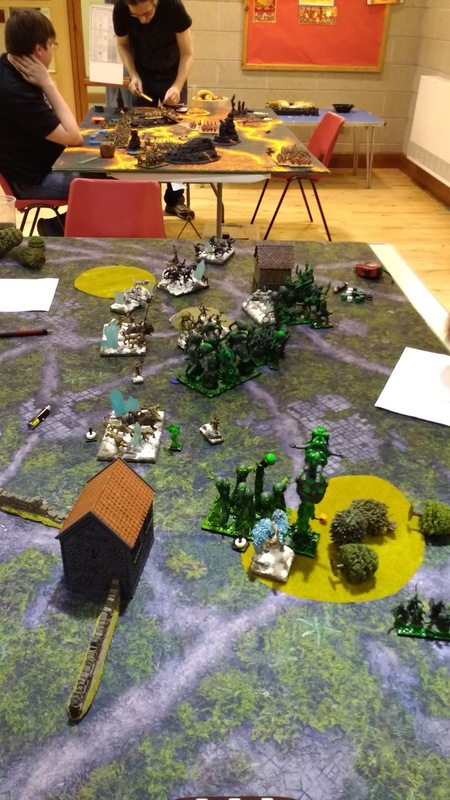 In the centre, The Green Lady prevents me flanking the Shamblers with my Spirit Walkers but thankfully they are able to get into the flank of Naiad Wyrmriders, and combined with a Stampede they are routed quickly. It takes me a few turns to chew through the Green Lady of course. Over the next turn I delayed Hal’s units just long enough to rout everything but a couple of units on the left, though I lose some too. Eventually I also kill the last couple for a big win. Game 2 – Andy Sharp – Goblins – Loot. 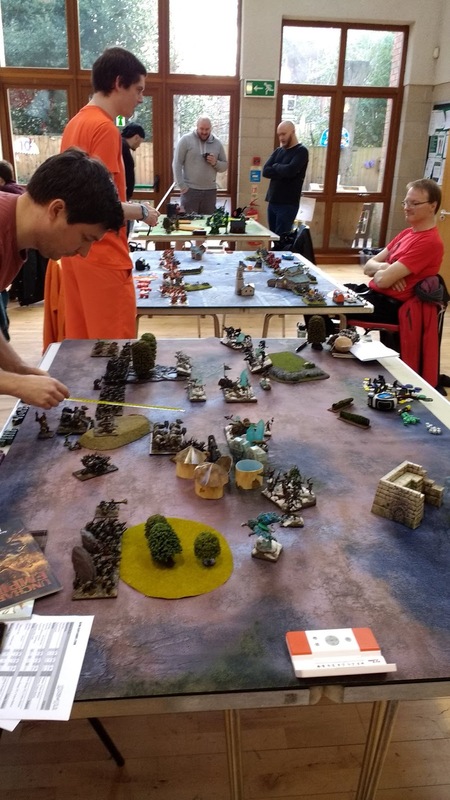 Interestingly Goblins were in 3 of the top 4 spots at this point having all won their first games! Last time I played Andy the game was a relatively easy win, not so much this time! I went first and sped towards the green line! Andy revealed more shooting surprises than you can shake a stick at! 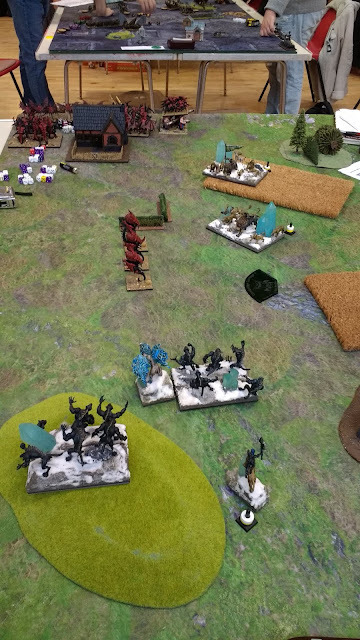 On the left my Chimera, Centaur Chief and the Spirit Walkers faced off vs two Goblin Rabble reg, a War Trombone and a Goblin ASB with a surprise Diadem of Dragon-kind. I thought I would kill this easily, not so much! Andy managed to waver my Chieftain on his first turn and then killed it the next. 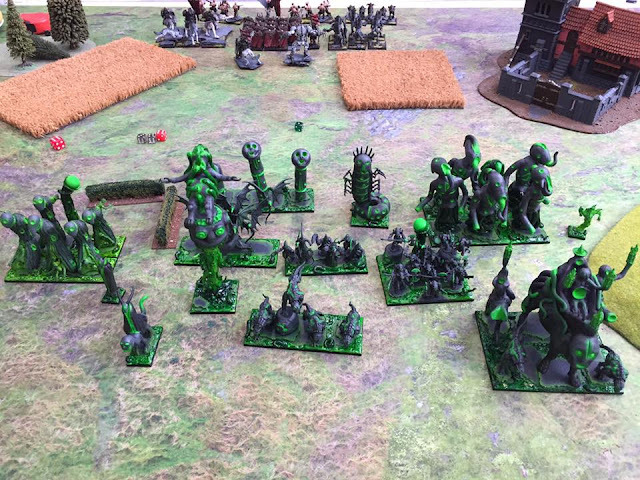 The Spirit Walkers killed the War Trombone then got stuck into a combat with Goblin Rabble that would last several turn before being losing to them! On the right flank my Lycans were getting shot up, but the damage wasn’t sufficient on either unit so between regen and Heal they were ok. I eventually killed all the goblins there by a tricksy Lightning Bolt 5 Wiz who just kept running away! In the Centre Andy very nearly took out my Stampede but it just survived a combination of the Mincers and Trolls + Bruiser, mostly thanks to fancy maneuvering and Yellow Bellied! Right at the end I had two Loot markers to Andy’s one, he had an amazing turn of shooting and rolled to rout the Stampede, a success would turn the game back into a draw. He rolled 11 to rout! Inspiring! Just ok… Phew! This ended as a big win to me, though it was much closer than I had initially expected! Aha this was a game I was hoping for, George will also be at the Masters and was using his Masters army, so this would be a great practice game for both of us! I was keen to see if my tweaks would make beating this sort of build easier. 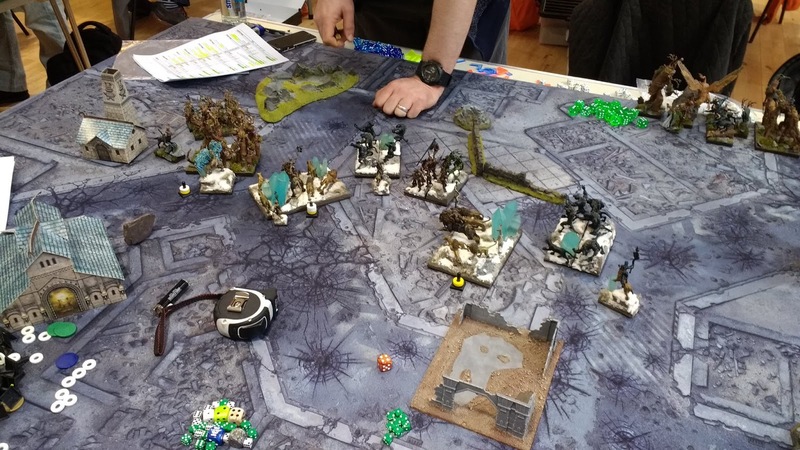 Advancing into Mind-screech is unpleasant so I decided to push forward on the flank with my Lycans and simply wait for George to advance closer. This worked pretty well, as they were then unable to do anything until turn 3, (range 18 + speed 5”, and we were 24”+ apart. ) When they did advance they were penalized and while they still routed my Spirit Walkers at least nothing else was harmed as well. 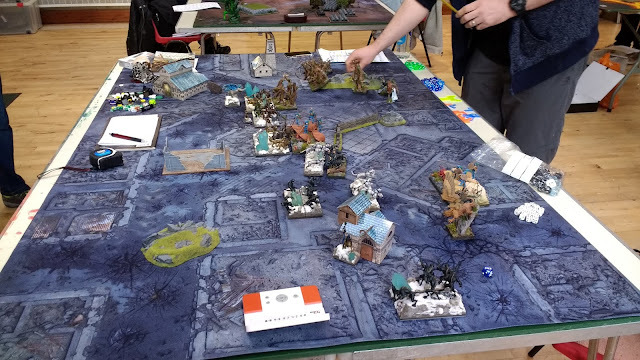 This gave me some needed time to advance on the flank, and while it took me a few turns by turn 4 I’d wiped it out and was able to refocus my Lycans and Chimera towards the centre. The Screeches concentrated on a Stampede but thanks to cover and some luck they were fine and then rear charge the remaining Fiends… Giving me the right. At this point on Turn 5 it just left me the three Mind-screech to deal with! On the right I threw the Chimera forward into a forest luring his flyers, this was a little risky and he did get wavered, the sacrifice worked though, it gave me the time to wipe the units out one by one. 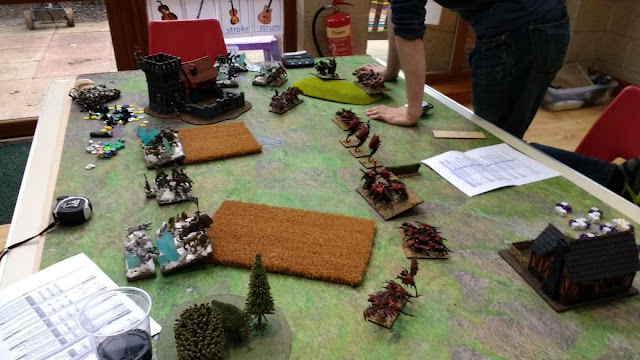 Eventually the Chimera died and the Well of Souls bugged out and got a sneaky flank charge into my Stampede fortunately not enough to waver it! I then managed to take down the Tortured Souls. On the left I sneaked some Lycans behind the building and used chaff to delay, this worked well and over the next few turns I was able to rout the remaining units for a win. Really fun game, and it felt much closer than the last time I played Dave, next time we play I think it'll be closer still! I was the only person to have won all 4 games on maximum points so I was crowned The King of War! (rather apt being the name of my blog) And got a lovely pint glass as below! Also rather awesome was my friend Jez came 3rd. 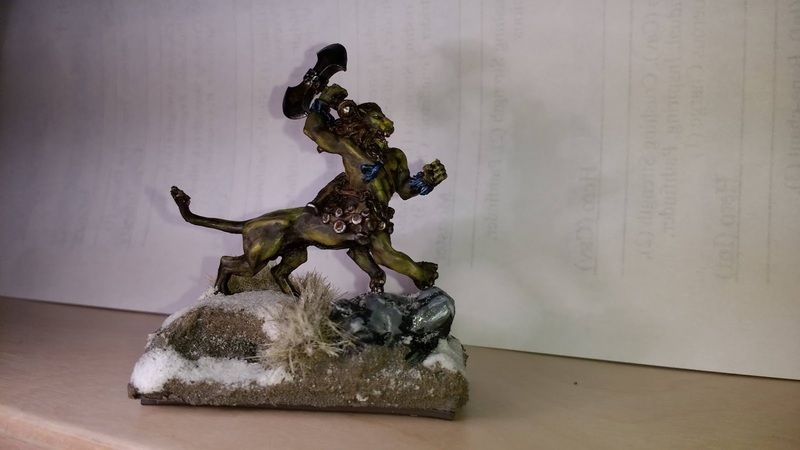 :) Hal won Best painted and Dave won the Facebook painting award, well done guys! 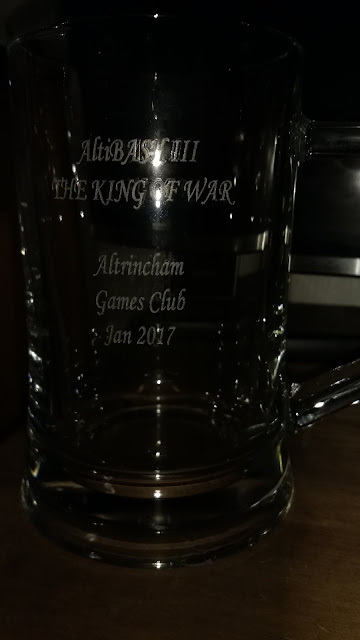 All in all a great event, I enjoyed catching up with so many friends, and had 4 great games of Kings of War! I would highly recommend the Altibash events to everyone, the fact they even provided healthy options for us also was amazing, great work guys! Looking forward to the next one. EDIT - Kev asked me to make people aware that he spent ages slaving over a hot oven baking scones, and while I resisted due to being healthy, they looked delicious!